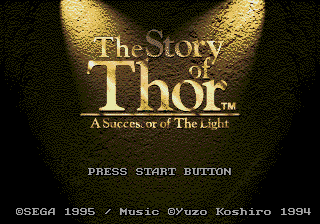 The Story of Thor: A Successor of the Light, called The Story of Thor: Hikari o Tsugumono (ストーリー・オブ・トア 光を継ぐ者) in Japan, La Legende de Thor in France, and Beyond Oasis in North America, is a 1994/1995 role-playing action game developed by Ancient for the Sega Mega Drive. It was followed by a prequel, The Story of Thor 2, on the Sega Saturn. Prince Ali has found the Gold Armlet, a magical artifact used by Reharl, a sorcerer, to defeat Agito, another sorcerer who wanted to destroy the Kingdom of Oasis with his Silver Armlet, a long time ago. Both sorcerers died and the armlets were lost until now. The Gold Armlet governs the four spirits of Oasis, which Ali must find in order to stop the person who has found the Silver Armlet from destroying Oasis. Pressing jumps, and holding crouches while walking. attacks. How long you hold for, how many times you have it pressed, whether or not you are jumping, and whether or not you are moving all determine which attack you perform (though it will always be either using your sword or kicking). is also used to talk to villagers. opens up a menu where you can equip weapons and items, check your progress, look at a map, and save. Furthermore, button is also used in this game. Pressing + switches between dagger and chosen weapon. Some cheats require use of buttons that aren't available on Three Button Control Pad. Main article: The Story of Thor: A Successor of the Light/Changelog. Main article: The Story of Thor: A Successor of the Light/Magazine articles.